Angus (non-dairy) and Clive (vegetarian) were due to come to dinner again recently. I’d done the usual poring over the cook books and wondering how much butter I could get away with without upsetting Angus’s palate – and then came the message that Kelly would love to join us. Always a pleasure to see her, but this added a thrilling twist to the menu – Kelly is on a low fibre regime at the moment. I was flummoxed, so I turned to Nopi, to see what words of wisdom Ottolenghi might have to offer. After some dithering and looking up what exactly the low fibre brief ruled out (quite a lot), I chose five spiced tofu with steamed aubergines and cardamom passata. 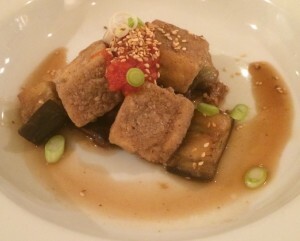 I have to be honest – if you had offered me this I might have headed for the door sharpish (I rarely think of eating tofu and steamed aubergines didn’t sound that appealing). But I should never doubt that Ottolenghi knows exactly what he’s doing – this was an excellent meal, so many lovely and complementary flavours. It didn’t get off to great start. First I managed to buy the wrong kind of tofu and then I discovered very late in the day that I didn’t have any ground cardamom. I spotted my tofu error early enough to sort that out myself, but had to pack Missy B and her friend off in search of the cardamom after school. They allegedly tried every single shop in Muswell Hill that might have sold it (and a fair few that were never going to have it in stock). All to no avail. They seemed to have a good time on the wild goose chase and Missy B even took it quite well when I showed her how easy it was for me just to grind up some whole cardamom that I did have in the cupboard. This is a fiddly meal to prepare with a lengthy list of ingredients (I’m not putting the recipe on here, others have posted it online), but I got lots done in advance and things were reasonably under control when my guests arrived. I was still pondering how to serve the rice, but Angus made me focus and we went for cardamom and clove rice, also from Nopi. I’m including this recipe, as it was easy, very tasty and I think it would make a fine accompaniment to many dishes. Place the oil and spices in a medium saucepan for which you have a lid. Place on a medium-high heat and cook for 2 minutes, stirring continuously, until the cardamom starts to turn golden.Add the rice, with 1¼ teaspoons of salt and a good grind of black pepper. Continue to cook and stir for 1 minute. Add the boiling water and reduce the heat as low as possible. Stir once, cover and leave to cook for 12 minutes without removing the lid. Remove from the heat, uncover the pan and quickly place a clean tea towel on top. Return the lid to the pan and set aside for 10 minutes. Fluff the rice up with a fork and serve. I will definitely make this meal again, even if I don’t have the dietary restraints – Jenny (aubergine-hater), you have been warned!! 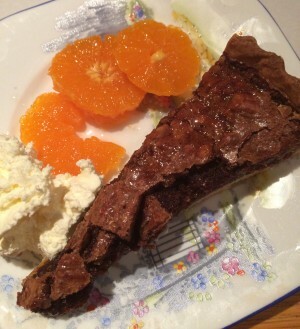 Dessert was Denis Cotter’s chocolate pecan pie, with whisky soaked clementines. Give it a try, it’s very gooey and rich and stays fresh for several days. There is a risk that you will keep returning to it for a sliver. And another, and another… The clementines not only contribute to your five a day, but they are a perfect citrusy accompaniment that cuts through the richness of the pie. I’m not going to give the pastry recipe – I had enough for a 25cm tart tin, which turned out to be the right size for the filling. You could do two smaller tins, or indeed little individual tartlets. Blind bake your pastry case. Pre-heat your oven to 200°C/400°F/gas mark 4. Gently heat the sugar and maple syrup until dissolved. Boil for two minutes, then leave to cool a little. Beat the eggs, egg yolk, cream and vanilla gently then beat in the syrup mixture. Melt the chocolate and stir it in. Roughly chop two thirds of the pecans and scatter them over the base of your pastry case. 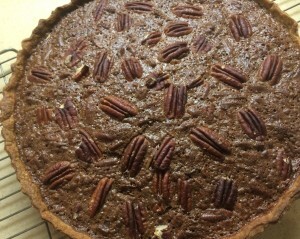 Pour the custard into the pastry case and arrange the remaining pecans on top. Bake at 200°C/400°F/gas mark 6 for 10 minutes, then at 170°C/325°F/gas mark 3 for 30 minutes until the centre is just set. Thanks to my ma for spotting I had omitted the instructions for the clementines… (Always read several times before you post, as I was advised just last night). Peel the clementines, slice into medium slices and put them in a bowl. Heat the sugar, water, cinnamon sticks and whisky together until boiling, then simmer for three minutes. Pour the syrup over the clementines and leave them to cool at room temperature. That’s all there is to it. Footnote: I have just bought some ground cardamom. In a shop in Muswell Hill. Steamed aubergines? You are a better man than I am, Gunga Din! I honestly share your concerns Moira – but it was astonishingly good, and not just because of my low expectations! Was it ordinary shortcrust pastry and did you cook the satsumas? Certainly would kick start the day! Thanks Mum – I have now edited the post!